Fab.com – Fab features great deals from fabulous designers. You can find a bargain on just about anything – from clothing to pet accessories – but I love browsing their home goods section the most, naturally. Gilt.com – Gilt offers major discounts on designer labels to its members. Just one catch though: great deals go fast. If there’s something you have in mind, you have to log in early or you could be out of luck. Etsy.com – I’m always surprised when I meet someone who’s never heard of Etsy. This is a great place to support small businesses while finding the exact thing you never knew you needed. Also, it eliminates the thing I hate about antique stores and resale shops: rummaging. Hello, Vintage English Deckchair! OneKingsLane.com – Like Gilt and Fab, One Kings Lane offers deep discounts gorgeous home goods. You can probably find bowls like these at Anthropologie for quadruple the price. BallardDesigns.com – Ballard Designs is more understated than other home goods websites I listed, but I still come across great pieces here. The lotus garden seat would really dress up my balcony. And I just can’t get enough jute lately. I’m digging these “American Atlas” posters by Brainstorm Print and Design. I wouldn’t mind having The South, The Midwest, and The West, since we’ve lived in each part of the country. I think it would be really cool if Brainstorm did each state individually, but with more detail. I mean, Texas is an awfully large state and has much more going on than oil, cattle, and cotton. And wouldn’t the complete set look great in a classroom? 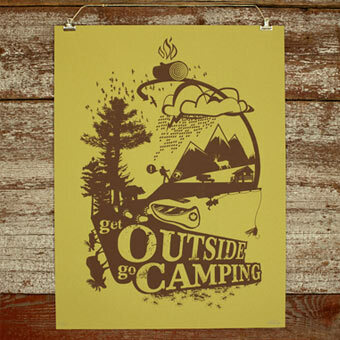 I’d put the Get Outside, Go Camping poster in Dave’s office, since his space is as much about his favorite hobby as it is about working. Shop their entire collection here. Fabulous job, Brainstorm! Dress up your windows! Putting in curtains is always a great idea, but especially when the floor is ho-hum. Curtains don’t have to be bright or patterned to draw attention and there are lots of affordable options. Invest in quality furniture. Distraction is key. If your furniture looks nice, it doesn’t really matter what’s on the floor. Hang pictures or removable wallpaper. I love the decals at Blik, and Sherwin Williams is a decent source for temporary wallpaper. Don’t put a rug on it! Rugs draw attention to the floor and bunch up under furniture. Covering ugly carpet with a nice rug seems like the obvious choice, but you’re better off investing in wall decor. Clean early and often. If the carpet isn’t new, make sure it has been professionally cleaned before you move in. Vacuuming regularly is a must. And talk to your landlord about how often they plan on having the carpet cleaned. How do you deal with apartment carpet woes? Cover it, distract from it, or learn to love it? 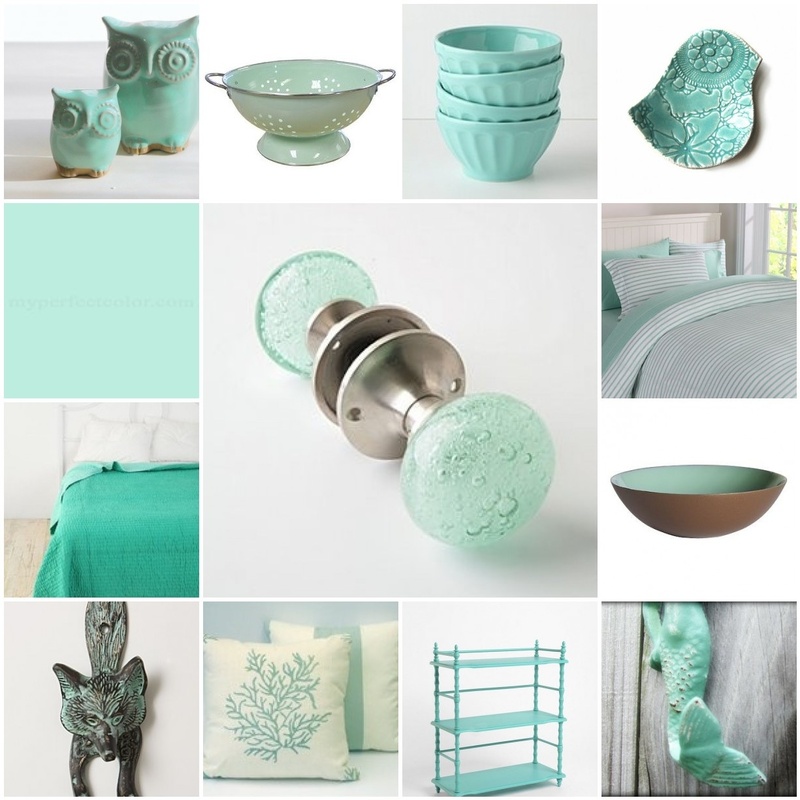 Seafoam Green is the color of summer. It’s combing the sand for seaglass, saltwater air, magazines by the pool, beachy fun. Not only does it go well with neutrals, it can hold its own against bold strawberry red and gold. Either way, a little pop of green goes a long way and can be easily incorporated into any room. Owl Figurines by claylicious at Etsy, $42. These little owls would be so cute in a nursery. Calypso Basics 7 Quart Colander by Reston Lloyd at Amazon, $30.99. Latte Bowls at Anthropologie, $20. Lacy Bird Bowl by PrinceDesignUK at Etsy, $22. Simple Stripe Bed Linens at PB Teen, $32-$119. Who says teens get to have all the fun? Enamel Metal Dipping Bowl at West Elm, $9. At this price these will be your new favorite bowls. Cast Iron Wall Hook by TheDoorStop at Etsy, $10. To hang your towels, of course. Old House Bookshelf at Urban Outfitters, $179. Stripe Pillow by SeashellCollection at Etsy, $50. So, you don’t have a beach house…yet. Sly Fox Doorknocker at Anthropologie, $24. Seed Stitch Quilt at Urban Outfitters, $69-$79. For those hot summer nights. Seafoam Green by Benjamin Moore, prices vary. Bubbled Glass Doorknob at Anthropologie, $32.